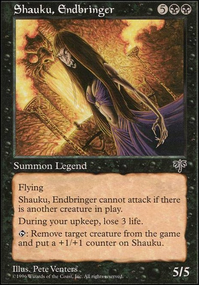 Shauku, Endbringer can't attack if there's another creature in play. 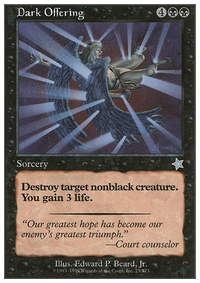 At the beginning of your upkeep, you lose 3 life. 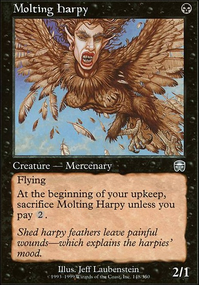 Tap: Remove target creature from the game and put a +1/+1 counter on Shauku. Is it wrong that I want to make Shauku, Endbringer work here? I started during Mirage and I have a soft spot for this card, it was my first rare. 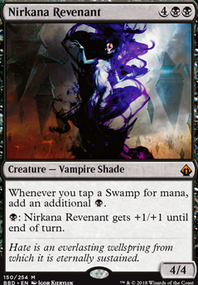 I think this and maybe Mairsil, the Pretender (bwahaha) are the only decks that could actually utilize this long forgotten vamp. Fernah14, thank you for the comment! 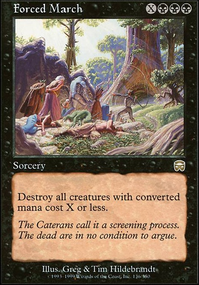 I have added quite a bit of removal in the deck to take care of pesky creatures and other problematic spells. 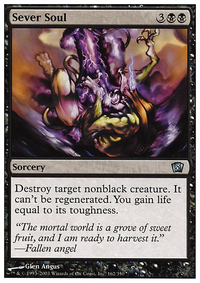 One way I have taken care of the removal is with Minion of Leshrac or Avatar of Woe . 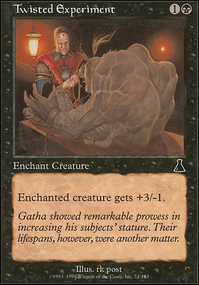 Both of which allow me to take care of creatures specifically, however if I had some untap shenanigans or Quicksilver Elemental effects to let me activate abilities more than once a turn each turn I have the potential to kill everything or even exile everything with Shauku, Endbringer . 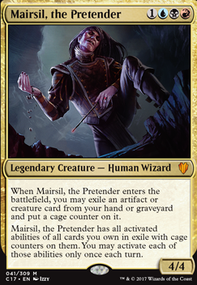 If I pair the creature destruction abilities with Eater of the Dead I get to exile every creature from every graveyard while also untapping Mairsil. 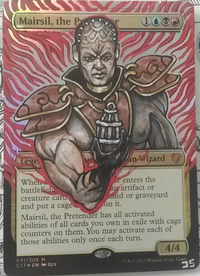 As far as mass removal is concered I have the Nevinyrral's Disk and Amaranthine Wall combo to make him indestructable in response to me activating the disk. 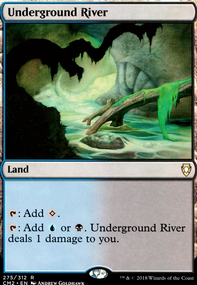 I also have added Evacuation paired with Mirage Mirror to turn Mairsil into a land in repsonse to casting Evacuation basically resulting in Cyclonic Rift . If you have any recommendations for removal please feel free to leave them in a comment. Thank you again! 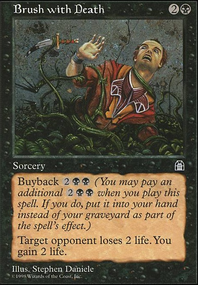 But yeah, Yargle’s a good idea. 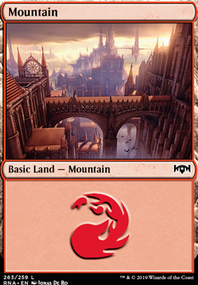 Maybe some manlands could provide some backup (especially (Blinkmoth Nexus). I'll just name 3 that I like for the listed categories. Looks good. 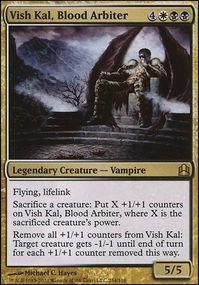 Some suggestions for cuts: Warmth is kind of weak and can be replaced with Elenda, the Dusk Rose (when you get her), Dega Sanctuary can be replaced with Vampire Nocturnus, Arguel's Blood Fast can be replaced with Greed or even Erebos, God of the Dead. 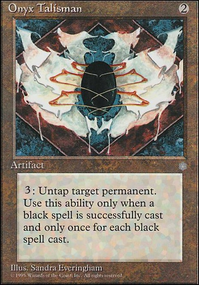 Or take the Necropotence from Rakdos and put it in here, it's better here anyways. 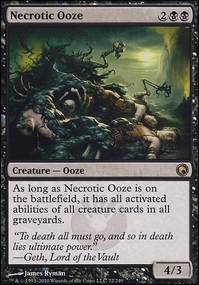 You could replace In Garruk's Wake with Dusk, it does double duty here, giving you back a bunch of your creatures when you flash it back. If you don't like Dusk, then Kindred Dominance would work in the overcosted wipe slot too. 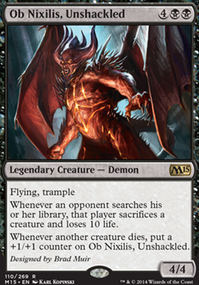 As for creatures, Annoited Deacon should probably come out, as well as Exulted Skymarcher, Paladin of the Bloodstained, Sadistic Skymarcher and Skymarcher Aspirant. 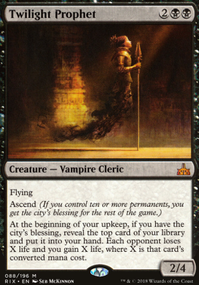 Options to go in include Stromkirk Condemned, Bishop of Binding, Bloodline Keeper Flip, Dusk Legion Zealot, Twilight Prophet, Indulgent Aristocrat, Kalitas, Bloodchief of Ghet, Mephidross Vampire, Necropolis Regent, Patron of the Vein, Shauku, Endbringer (less important than maybe other creatures), Soul Collector for giggles, Thief of Blood, Viscera Seer, Vampire Hexmage or Vish Kal, Blood Arbiter. 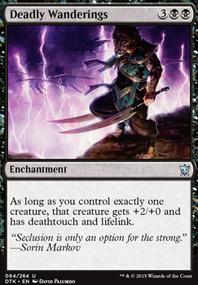 Other options for the deck include Zealous Persecution or Stensia Masquerade.